Development of materials for electrochemical energy storage devices such as electrochemical capacitors and batteries is a major research focus in the NMG. This includes development of new carbon materials as electrodes as well as design of new electrolytes for testing in these devices. While carbon materials can be both porous and nonporous, they are each important for our research into electrochemical capacitors. 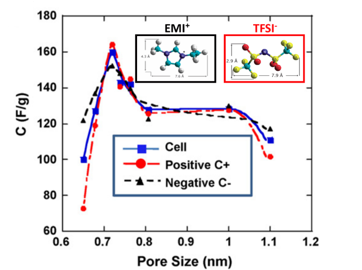 In porous carbons, the relationship between the pore size and ion size is extremely important. In a study by our group, an ionic liquid ethyl-methylimidazolium bis(trifluoromethanesulfonyl)imide was chosen due to the relatively equal sizes of the cation and anion (0.76 and 0.79 nm in the longest dimension, respectively).1 By holding the ionic liquid constant and manipulating the porous carbide-derived carbon (CDC) to have a range of pore sizes, an optimum pore-ion size relationship can be seen. The maximum capacitance is reached at a pore size of ~0.7 nm, which matches the ion sizes in the electrolyte (see figure 1). This and similar studies emphasize the importance of matching the pore and ion sizes for optimized electrochemical capacitor performance. In addition to the ion size-pore size relationship, it has been shown that the surface functionalization of the carbon materials can have a large impact on the electrochemical capacitor performance. Recently, our group used porous CDC materials as the electrode material of choice and by functionalizing the material in different ways, experimentally compared the effect on ion dynamics and resulting performance.2 The three well-defined surface chemistries studied were defunctionalized (annealed), hydrogenated, and aminated carbon. The three materials were tested to have the same pore size distribution for accurate comparison. The results of electrochemical testing reveal that even at low sweep rates, the hydrogenated CDC exhibits a higher capacitance than the annealed or aminated CDC. Additionally, none of the added functional groups or side oxygen groups exhibited pseudo-capacitive behavior, and therefore the charge storage for all three CDCs were purely ion electrosorption. It can be concluded from these results that defects and surface chemistry can be beneficial to capacitance but in most cases the influence of functional groups is selective. While some may increase capacitance or ion mobility, others may decrease the performance. Future electrode designs need to take into account the presence of surface groups and/or the benefits of introducing them for certain systems. Largeot, C. et al. Relation between the Ion Size and Pore Size for an Electric Double-Layer Capacitor. 2730–2731 (2008). Dyatkin, B., Mamontov, E., Cook, K. M. & Gogotsi, Y. Capacitance, charge dynamics, and electrolyte-surface interactions in functionalized carbide-derived carbon electrodes. Prog. Nat. Sci. Mater. Int. 25, 631–641 (2015).